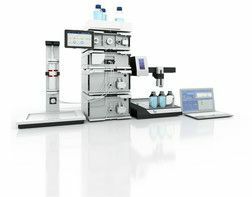 KNAUER’s AZURA preparative HPLC system is extremely versatile, since purification tasks can change frequently. AZURA Prep LC was developed and designed by scientists in the laboratory, to ensure highest flexibility and comfortably handling of large sample volumes. AZURA is perfectly suited for the purification of your products such as synthesis stages or active ingredients. Easy to operate and maintain, AZURA systems can be optimally adapted to the scale you need.